Our Preschool Explorers is back for the fall and my first storytime of the season was about firefighters. A couple of summers ago, we did a firefighter storytime and invited the local fire department to come down, which was really fun. They were super happy to do it, so don't hesitate to reach out. This time around was a more casual affair since it was just part of our normal storytime schedule. Book: Fire! Fuego! 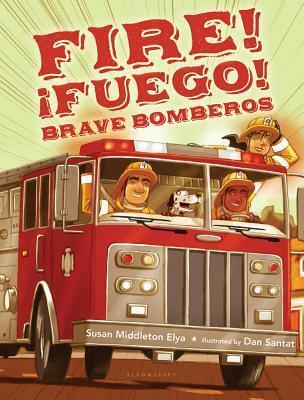 Brave Bomberos by Susan Middleton Elya, illustrated by Dan Santat (Bloomsbury, 2012). This brightly illustrated book shows a team of firefighters responding to a local house fire and sprinkles Spanish words in with the text. Before I started, I went over two Spanish words that happen a lot in the text: bomberos (firefighters) and fuego (fire). I wanted to share this one because it's a great adventure story and I wanted to include some diversity in my storytime. A lot of firefighter books are along the same lines as this one: the process of firefighters responding to a call, so why not choose a diverse book? This is a great action song to get everyone up and moving a little bit. I also love that we use our imagination. After reading a book about firefighters putting out a fire, we used our imagination to pretend that we were putting out a fire. Since a kitty gets rescued in Fire! Fuego! Brave Bomberos, we added that to the end of our song, climbing the ladder one more time and then holding out our arms for the kitty cat. 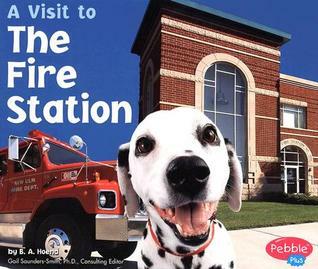 Book: A Visit to the Fire Station by B.A. Hoena (Pebble Plus, 2004). I love Pebble Plus books for adding nonfiction to preschool storytime. The large trim size and clear, colorful photos make this series nice for sharing with groups, while the easy text is straightforward enough to share with young children. I chose this one because I wanted to include a book with real photos. 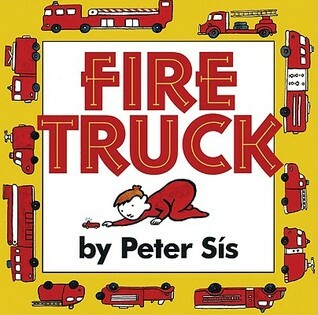 Book: Fire Truck by Peter Sis (Greenwillow Books, 1998). I have a soft spot for Peter Sis, since I did my illustrator project on him way back in library school. This imaginative story is illustrated almost exclusively in black and white and red. Young Matt loves fire trucks so much that he turns into one and races around his house having adventures until he smells some pancakes and goes to have his breakfast. Again, a lot of firefighter books are pretty similar, so I chose this one because it's something a little different. I didn't have anything that specifically related to firefighters today, so I just put out blocks, cars & trucks, our color boxes, and let them manipulate the fire station stuff on the felt board.